Alesis DataDisk SQ - "Alesis Data Disk - All your synths now belong to us"
Elektron Monomachine SFX60+ MKII - "A surprising device"
Akai MPC X - "A great device!" Novation Circuit - "A nice plaything with potential"
Arturia BeatStep Pro - "Easy to use, efficient and practical!" Korg Electribe Sampler - "A stupid concept"
Squarp Instruments Pyramid - "Squarp Pyramid, or how to get rid of your computer!" 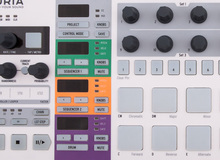 Akai MPC Live - "A well-conceived, efficient and inspiring device"
Akai MPC3000 Limited Edition - "All Hail Roger Linn! This & the 60 Are The Warmest MPCs!"